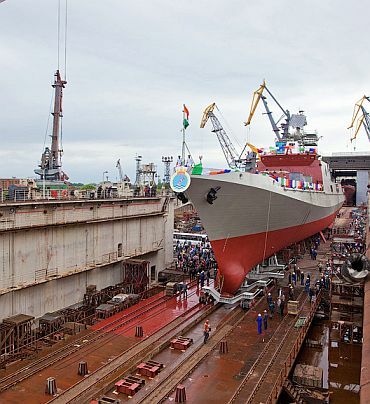 A new Talwar class stealth frigate built by Russia for the Indian Navy was launched at a solemn ceremony at Yantar Shipyard in Russia's Baltic exclave of Kaliningrad. 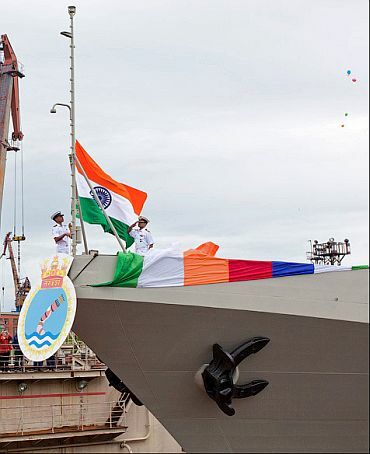 Ira Malhotra, wife of newly-appointed Ambassador Ajai Malhotra, launched the stealth frigate 'Trikand' -- the third of the three stealth frigates christened by President Pratibha Devisingh Patil along with 'Teg' (Sabre) and 'Tarkash' (Quiver) in the Navy's tradition of naming the same class of warships beginning with common letter. "Trikand", means a mythological arrow with three heads. The first warship under the present project, "Teg", was launched in November 2009. 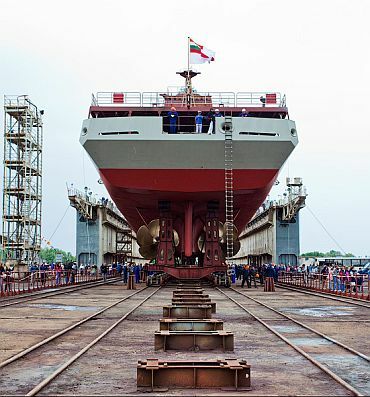 The second ship, "Tarkash", was launched in June 2010. 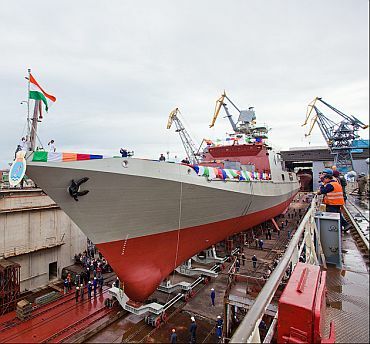 Delivery of all three ships to the Indian Navy and their commissioning will take place during 2011-12, after completion of outfitting works and extensive trials in harbour and at sea. Like its predecessors the INS Trikand will carry the supersonic BrahMos missile system. It would also be armed with advanced surface to air missiles, 100mm artillery guns, and other sophisticated equipment, as also a deck- based KA-31 helicopter. The INS Trikand is powered by four gas turbines and is fitted with state -of -the -art navigation, communication and electronic warfare equipment. It is also equipped with a very advanced radar and sonar systems for early detection and warning. Deputy Head of the Defence Committee of the State Duma, Savenko, Deputy Commander-in-Chief of the Russian Baltic Fleet Vice Admiral V P Kravchuk and top officials from ROSOBORONEXPORT state arms exporters, United Shipbuilding Corporation, Federal Service for Military Technical Cooperation, Russian industry and public representatives also attended the ceremony. Ambassador Malhotra congratulated workers of the state-owned Yantar Shipyard and all associated organisations upon the successful launch. He recalled that defence cooperation was a key pillar of the special and privileged strategic partnership between India and Russia, and that that the launch of INS Trikand reflected the sophisticated level that India-Russia defence cooperation had achieved. Malhotra noted that joint development and construction of advanced and frontline defence system and platforms, such as INS Trikand, had become a new hallmark of India-Russia defence cooperation. Earlier, Russia had built INS Talwar, INS Trishul and INS Tabar at the Balitiisky Zavod shipyard in St Petersburg.